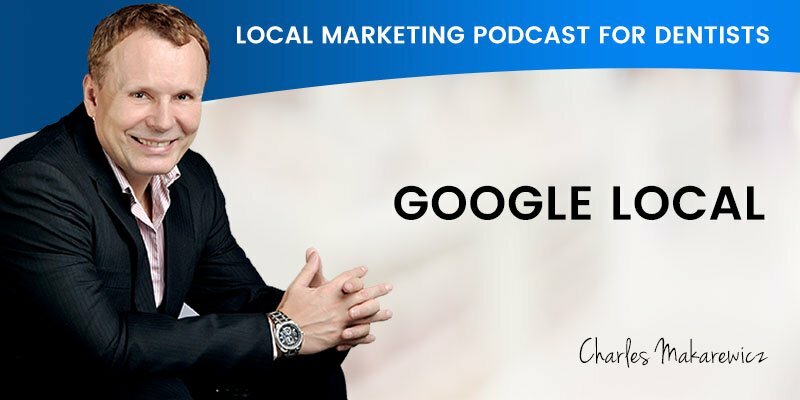 In today’s show, we cover “Google Local” and why dominating Goole Maps search is crucial to every dental practice in Australia. Scott: I’m Scott Edwards, and today I’ve Charles Makarewicz with me to discuss Google Local and its relevance to your dental practice. Charles is a founder of Dental Marketing Expert. 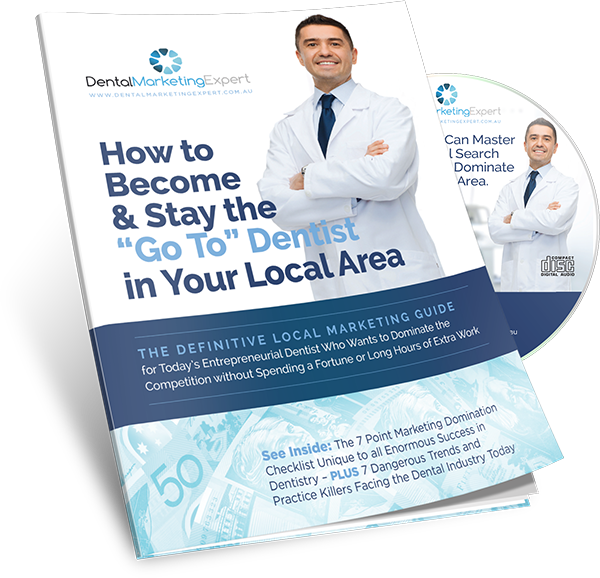 A company which specializes in local marketing for Australian dentists, and is responsible for many dental practices across Australia dominating their local competition, and attracting up to 15 new patients each and every week. Welcome to the show, Charles. Charles: Thanks Scott. Good morning everyone. Scott: So today we’re here to discuss Google Local and its relevance to the Australian dental practices. Charles, can you explain to our dentists listening, what exactly is Google Local? Charles: Google Local is a Google Maps search engine, and what we want to focus on is Google maps search results. If you do a Google search using your phone or a desktop, Google will pull up the result showing Google maps based on your search criteria. The most common searches use the format “dentist” plus “the suburb” when searching — for example, “dentist Kew”. When you type that in Google search, it will pull up a map-based result. So Google Local for us is those results triggered local keyword. Scott: You’ve touched on how people use Google Local and what it provides for them. It’s the same as if they are looking for teeth whitening or a dental emergency dentist in a certain area I suppose Charles. But as a dentist, how important is it to not only embrace but also manage their local presence on Google? Charles: I’m sure by now most dentists understand the importance of Google maps. First, that’s where the patients are — the new patients and those who had been recommended by a friend, they try to find you. The most important part is to be listed in the first three results in Google maps. Before, there were 11 Google map listings. It was reduced to 7, and finally to 3 listings. The realestate has shrunk, and now there are only three spots on the first page of Google, which pretty much take more than 90% of all the calls. That’s why it so critical for a dental practice to be listed in the first three and that takes effort and time. Scott: So what you’re saying Charles is, particularly in mobile devices, that if you’re not appearing in the three local listing, then you’re at a major disadvantage against your local competition? Scott: So what does it take if your dental practice is not appearing in the top three or even not at all to be visible and generate substantial opportunities to attract new patients? Charles: It is like with everything really. It’s reverse engineering. Google has an algorithm which looks for certain indicators. There are about 200 plus indicators known to us, which help rank in the first three. If you are involved like we’ve been involved for over six years, we managed to create a reliable and proven systems to deliver what Google wants. It starts with acclaiming your Google map listing. You have to start from accuracy of your NAP. Google Local or Google maps, in the core foundation, is looking for NAP. This is the name, address and phone number, and pretty much where your digital asset starts. Your digital asset in regard to Google Local mean having a physical location, address, business name, and phone number. Majority of new clients don’t understand that. They don’t understand that NAP is their asset, and the accuracy of the NAP is critical. So if you have different phone numbers listed in yellow pages, another number for Facebook because a digital agency told you that you should have tracking numbers, and have different phone numbers everywhere, the problem with that is — Google is confused and you’re basically not going to rank. Well, if you take one thing from this call to heart, that is your NAP –understanding that it is your asset, and that its accuracy is critical for your business long term. Google is looking for more than 200 signals to rank you on Google maps. NAP is the first one and is very critical. If you break the NAP, there’s no point of even going into anything else. So before you even think about implementing additional strategies, Google will want to see that NAP is consistent across all online media, social profiles, citation directories, and any other online reference to your business. Just a quick recap on paid advertising and Google maps, you’re probably concerned about it. When running Google AdWords or any other paid advertising, your digital agency company will say that you need a tracking number. You must have it. Yes, you can have it. So let’s have for example, Google AdWords. You’re working with Google AdWords company, and they ask you to put tracking numbers on your website. That is a problem because you will confuse Google. Not all the tracking codes are compatible with Google. And if Google sees a different phone number, NAP accuracy is compromised. There is a solution for it. I highly recommend that Google AdWords traffic be set up using landing pages. Do not send Google AdWords traffic to your website. And in this case then you don’t have to update the phone numbers on the website. You simply can have a different tracking number on your landing page, which is then removed from Google indexing. So Google doesn’t get confused. The paid traffic goes to that landing page, you got your tracking number, and you can do whatever you like with those pages. They are specific dedicated pages for Google AdWords. Another benefit of using landing pages is the removal of confusing and irrelevant information in your website. There’s purely message market match. So you win. You get a better return on your Google AdWords in regard to running campaigns. The second component doesn’t apply to every dental practice. It is only applied to brand new dental practices or those rebranding. For these dentists, this tip is really valuable at this point in time. The algorithm can change. For Google maps ranking this might have some effect. But I think what’s more important is not just to rank in Google but also in any other search engine, pretty much anywhere on the internet. So let’s get straight to it. For a brand new practice, I recommend considering the keyword itself in your business name. For example, if I have a brand new dental practice in Kew, I will consider naming it Kew Dental. It has two main components — the “suburb” as the first, and then second is “dental”. You could name it Kew Dentists, but that’s not a good brand name. Google nowadays recognizes the dentist and dental as a very similar term. It will rank for dentists even if you use dental as a keyword. The first thing to do is search for that suburb to make sure that no one else is using it. For example, there is another Kew Dental, you could consider Kew Dental Group, Kew Dental Practice, or Kew Dental Center. There are a lot of options. However, there’s small problem. If Kew Dental already exists, someone may be searching for it and basically think that you are the Kew Dental. That’s not the worst thing. You could probably pick additional patients, if they just heard it from someone but never visited Kew Dental themselves. It might even add traffic and bookings. So it’s not the worst thing. It is your own personal decision in this case. Again, this second most important signal does not apply to every single dentist, but I would say that there is percentage of dentists who would be really interested in that. Now let’s go to number three — Google My Business listing. You need to claim it; you need to make sure it’s accurate. After ensuring NAP accuracy, we need to look at the categories. If you look at dentist, number one category for dentist is actually “dentist”. Then you have “dental practice”, which is a category in Google My Business, then things like your treatments. You can look at “teeth whitening”, at the “dental implants”. We’re looking at up to 10 relevant categories you can set up in Google My Business for dental practice. If you’re doing those services, please make sure they are all included. Additionally, Google My Business is constantly evolving. There are a lot of new features coming in the Google My Business, and sometimes they last for few years, sometimes they don’t. What I will cover are those included in Google Maps right now, what’s working, and what I recommend we should focus on. Number one is, Google has posts. This is new. You can post your promotion and educational materials in Google post, but they only last for seven days. Hence, Google posts are not highly indexed in Google. They are not something you rank for, but they help you with your exposure. So imagine that right next to your listing is a special offer, or you have something that happened in your dental practice, perhaps you start new services. If you start doing orthodontics, you can promote that. It’s very visible in the search results within your Google My Business listing. Additionally you have to focus on getting images for your dental practice. Google My Business loves images. Those images shouldn’t be generic images of the dentists. We’re talking about the dental practice, you need to have dental practice images. Let’s recap on the type of images you can have. You can have a team images, images outside of your dental practice, reception images. You can include a lot, and ideally professionally taken images. We also recommend looking for a photographer who can do a 360 Google tour. It is highly beneficial. It’s loaded in Google My Business, and it shows up in search results. We specially recommend this to new clients but if your dental practice is very old, perhaps you need to have a renovation, and do the 360 degree Google tour after. For a brand new practice we highly recommended a 360 degree tour with up to 40 images taken. This covers most of the Google My Business listing. There might be some additional changes and additional features coming in. Watch out for that and we’ll be covering that in a podcast in upcoming months. Let’s go to number four — the website. How important is the website? Well, it is very, very important. Google owns the Google My Business listing and yes it is an asset, but then nothing beats a website. This is something you own and no one can take it away from you. You can build your website including your branding, conversion systems, as well as create a hub, like a media hub for education based marketing. The number one thing I would consider in building a new website is reviewing your own branding and your positioning. What type of services do you offer? What do you love doing? What would you like to promote? I would then create a top 10 treatments list first, and then review for possible offers that can be added. Next we look at your color schemes. So if you have a logo, your website should have those colors. And if you look at the dental itself, the dental industry color is blue. This is the preferred color, unless your logo is completely outside of that color spectrum. Blue is one of the best colors for a dental website. That’s just the aesthetics. Honestly, I don’t like to focus just on the pretty websites. I think that’s the biggest mistake dentists make – that the number one thing is that the website has to look fantastic. They don’t think about the conversion first, how fast the website is loading should be first. Is it a secure website? Is it SSL? Those are ignored in the beginning. I think changing the priorities is critical in building the website. Create the website for Google and user first. Yes users like pretty websites, but if your website doesn’t load in the first click, especially on a mobile phone, if you have to wait for 5 to 10 seconds on a mobile to load those pretty images, well you’re gone. The visitors are not going to wait. And there’s a proven statistics that if your website takes more than three seconds to load in a mobile, half of your visitors are gone. Don’t make this mistake of going for pretty and compromise on page loads. I can talk about the website for hours and hours. I think we don’t have that much time. This is only a twenty-minute podcast. In the future months we’ll have a full twenty-minute podcast just about the website. What’s important in regard to website is what Google is asking for — what about the conversion, what the users like, and what’s the highest conversion systems for building the website. We’ll cover that in upcoming podcasts. Let’s run this up with the number five — content marketing. The dentists like to see their website finished after the first month and pretty much stop all the work. Because there are 30 to 40 pages done and all the treatment pages are done. Everything looks nice, there’s about us page, team page, and all those pages are created, they studied, they look pretty and ready to go. Well that’s not the case. So if we reverse engineer Google, you want to please Google, want to give Google what it wants, we need a dynamic website. A dynamic website equals content, more content, regular content. Content marketing fits with that really well. And there are two things which we need to pay attention to. Number one is regularity of the content. We recommend to have a content done weekly, as well as focus on its quality. There is no point in rushing and creating something, which is really a short in regard as an article. We’re going into longer and high quality articles, as well as other media like videos and podcasts. So what I recommend is if you’re a dentist and you have a good voice and you’re happy doing that, dental podcast is really a good way to do content marketing that can be distributed to various podcast platforms, or in your website in your blog. Additionally, things like infographics, to have more visual appeal. This comes under the umbrella of image marketing. So what’s an image marketing? You can have infographics, images with quotes, images with dental jobs, images which are branded. It could be a dental practice or it could even be some generic images. But make sure everything is branded, and don’t take anything out of the internet. Don’t do a Google search and say, I can just copy and paste part of the image and that’s fine. Please don’t do it. I’ve seen one of the businesse got sued for using images from the internet. We’re looking at around $1,000 Australian dollars per image. So please don’t do it. That could be very expensive. We as an agency have access to 5 million images. We use a number of services for $1000 to $2,000 a year. We pay for it and our clients have access to that. Obviously it is important that you’re protected, and you have access to images because Facebook, Instagram, Pinterest, even Twitter, all use images. Image marketing, video, infographics and articles all need quality images. And one more thing is, the complementary education content for treatment pages. Alone, treatment pages don’t really work so well. Creating the content around your top 10 treatments is the first thing to work on. So your topics are already there, think about the questions your patients may ask you, and create a really high quality content around it. Imagine if someone wants a dental implants treatment, and they’ll be spending up to $30,000. They don’t just come in and click and book an appointment and spend $30,000. You need to educate them. So content marketing, helps you to rank, helps you to educate your patient, and helps you to convert them to high paying patients. They spend a substantial amount because you were the natural choice for them. You were the one who educated them about the benefits of dental implants, or benefits of a certain type of orthodontic treatment. That is something which can be underestimated. We think that without content marketing, and without that strategy, you are very vulnerable to your competitors, and having just a static website is a big disadvantage to you. This completes the first top five signals. Let’s recap and review the additional five. So I’ll give you top 10. I’ll pass you to Scott. I think Scott can go through our list because he is really paying attention. So we’re going to recap and he will add additional one. We already talked with Scott about it, and he will mention them to you. We’ll be covering them in details in our future podcasts. So we have a podcast for website, a podcast for Google My Business, citation directories, social media, online reputations, and a lot of others. Back to you Scott. Scott: There is a lot you’ve gone through there Charles, and you mentioned that there’s over 200 components to help you rank on Google maps. We’ve just touched on top five now, but I’ll go through the rest now. You gave me a list of the top 10, and I’ll read them out just to recap. So the top 10 components to get you ranked higher in Google maps are, the NAP — the name, address, and phone number consistency, and understanding that it is actually the number one digital asset. The second we talked about is the dental practice name and the relevance for that. The third was the Google My Business profile. Make sure everything’s accurate and up to date on that. The fourth was the dental website. Our fifth was content marketing. Our sixth is citation and profiles, which we’ll talk about in a future podcast. The seventh is local community engagement. The eighth is social media, the big elephant in the room. We’ll address that later on too. Ninth we’ve got to look at our online reputation management, and tenth we have systems for measurement and correction. So that’s the top 10 components out of 200 plus that you’ll look at. Is this something that can be done in house Charles? Charles: Yes, definitely. But you would need a full time marketing manager, probably with an assistant. If you look at the costs, this could be running into $50,000, $100,000 or more. There’s a substantial investment in dental practice we need to make, and obviously you need to develop your own systems. I think long term, yes, it’s a valid thing if you have a large practice, and multi location maybe that is something you could consider. But if you’re a small practice with even a few locations, or even medium size that’s probably outside of your budget. So I will look out for something a lot more economical, and I’ll look out for actually an agency who will do that for you, and that will be more cost effective. Scott: So for our listeners, who need to act on Google local, which I’m sure they do, but they’re not in a position to look after it in house. Why should they be speaking with yourself? Charles: We cover all those grants plus additionally we’ll look at a really large number of other signals where we will work on to get you to the top of Google maps. And we specialize with working with dentists. We offer 30 days money back guarantee. We build the free dental website, and we guarantee results that after six months working with us, you get up to 15 new patients each week. So, that’s all from us Scott. Scott: That’s pretty impressive Charles, but another key note you didn’t mention was ara exclusivity. Every new client we take on, we look at the area they’re in, and we don’t take any other clients within the same area. That improves the integrity of their systems and gives the client the best results. How long would it generally take from when you take on a new client to the point where the dental practice is appearing in the top three local listings, and generating new patients for the practice? Charles: So as I mentioned before, six months is minimum. There are top three things, you need to look at — how competitive is the market place, an active competitor with a huge budget, and if you’re just starting a brand new practice in a very competitive market, I would say 12 months will be minimal. If it’s a less competitive market and with only a few dental practices, it will take less time, perhaps even under six months. We require our new clients to have a verbal commitment. We don’t lock you into any contracts, but we’d like to see the verbal commitment for a minimum of six months. Scott: So once you generate those results for your client, does your work stop once they’re getting the results, or is it an ongoing management and maintenance commitment? Charles: Well, it’s definitely important to understand that, when we get you to the top of Google, the competitors don’t stop. The corporate won’t simply avoid you. They’re going to come into your area and try to dominate. So the work never stops. We’ll keep on building, putting another brick, build walls around you to protect you. With content marketing, if you stop doing content, stop doing citations, stop improvements to your website and stop creating new pages, what will happen is Google will stop giving you credits. The lesser the credits, the more vulnerable you will get, and your ranking will start sleeping. The last thing you want is to be number one, drop to number two the next month, then number three, and then you disappear. We assure that we get you to the top, and we’ll keep you there. Scott: So if our listeners want to talk with you Charles, and discover the opportunities your team can provide to deliver them up to 15 new patients each every week, what should they do? Charles: The first step would be to go to our website, dentalmarketingexpert.com.au and request our info pack. Scott: So there you have it folks. Once again that website address is dentalmarketingexpert.com.au, and Charles, thanks for joining me today. Scott: Thanks for joining us and keep an eye out for our next show where we’ll be talk about mobile first, and the importance of actively embracing it not only for the user experience, but also for the Google rewards that come with it. Until next time, bye for now.